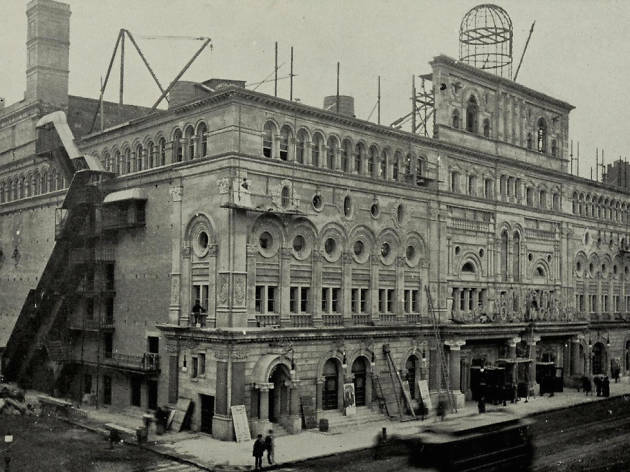 According to reports at Playbill and Curbed New York, construction workers at the Times Square Toys R Us located at Broadway and 44th Street have unearthed the 121-year-old remains of the entertainment complex originally built there: the Olympia Theatre. Theater educator Howard Sherman snapped some up close shots of the remains and kindly shared them with us. In its heyday, the mighty Olympia housed two venues, the Lyric and the Music Hall, in addition to a roof garden and even rooms for gaming. It was built by theater tycoon Oscar Hammerstein, grandfather to the great lyricist and book writer Oscar Hammerstein II (born the same same year the Olympia opened). Cool news for anyone interested in city history and the rich, buried culture of Broadway. Unlike the Hudson Theatre, which returns to service as Broadway’s 41st venue in February with a revival of Burn This starring Jake Gyllenhaal, there’s zero chance the Olympia will rise again. First of all, it’s not much more than rubble, fragments of an orchestra pit. Second, the owners of the building are not interested in theater preservation; they plan to erect a massive flagship store for Gap and Old Navy. As a popular destination for live entertainment, the Olympia spaces went through various changes of name and owner. The Music Hall became a movie theater in 1915. And the original structure was demolished in 1935. So what played at the Olympia for those brief, golden decades? A quick search on Internet Broadway Database turned up some fascinating titles and legendary names. At the Music Hall, song-and-dance pioneer George M. Cohan was a regular with Little Johnny Jones, Forty-Five Minutes from Broadway, George Washington Jr, Cohan and Harris Minstels, The American Idea and the humble-sounding The Man Who Owns Broadway. The place saw tons of now-forgotten light opera: Naughty Marietta, anyone? (Actually, the title is now obscure, but one of Naughty Marietta's hit tunes was "Ah! Sweet Mystery of Life.") Ziegfeld brought his Follies girls there in 1908 (and also 1912, by which time the venue was rechristened the Moulin Rouge). Mae West (left) swished her hips across the stage in A Winsome Widow. 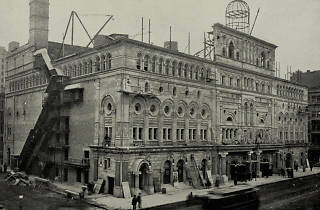 The Music Hall’s final theatrical offering (by 1914 it was called the New York Theatre) was a gritty "scarlet trade" exposé by Rachael Marshall called The Traffic. The Lyric, the other big theater in the Olympia, had its own storied successes—scores of now-forgotten comedies, dramas and musicals. It continued producing live work till 1920. Matinee idol Lionel Barrymore rang down the final curtain at the Lyric—sorry, the Criterion Theatre—in 1920 with a French legal drama called The Letter of the Law. There's no mention of what's been on the site since 1935. As for "historical significance", I don't see much. It doesn't seem to have been a major theater, and it wasn't around all that long. The number of name changes alone tells you that it was probably a second-string house. How can one allow the remains of this unique historical site to be the pit of an Old Navy store!!!!! this is historic content!!! where is in parks department ??? the historic preservation department of New York City?? do you really just cover this up with Flagship stores!! what an incredible find what an incredible history George M Cohan Mae West and you're going to build an Old Navy over it and the Gap disgusting!!!! @Mema S Every single building in NYC is historical. The entire city would be a museum if no one was allowed to build over precious sites. That is actually the thing I loved most about NYC...no matter where you were on the tiny island of Manhattan, you KNEW without a doubt that something important happened there and someone ridiculously famous stood where you were at one point. Good thing you can come up and see MAE WEST on her birthday, celebrated on Wednesday, August 17, 2016 this year -- in the same room where she faced a judge who sent her to jail (in 1927). The venue is now Jefferson Market Library on 6th Avenue and West 10th Street. Put on your party hat. This event is FREE. Naughty Marietta is obscure? Is Mr Cote really younger than 30? Sheesh! I used to work for TRU in the corporate office. I remember when we were building TRU TS , the sub basements are amazing. There was a clay walled tunnel that loked like somethng that was supposed to be part of the subway as well as a large and very old bank vault style room. I still wonder about their origin, hope there is some follow up during these renovations. NAUGHTY MARIETTA is at least remembered as a 1934 MGM musical adaptation starring Jeanette MacDonald and Nelson Eddy, typically available for viewing on TCM. .
@Barry R : I screeched out loud when I read this. Naughty Marietta is certainly not forgotten! Just because the writer isn't familiar with it, it shouldn't be deemed "forgotten"! Oscar Hammerstein was the composer's grandfather, not father.